Accordig to the supplyig standard service such as NFPA, VDS, BSE and SNIPP. 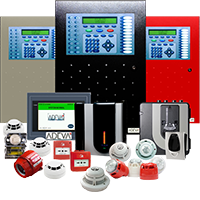 Our product line includes; Fire detection; conventional and air sampling systems with intelligent systems, also line type heat detection, channel-type smoke detectors, also including Industrial flame sensors, our technical staff is available and can respond to any technical issues or problems occurred. Our Products and Service are being utilized by 200 partners and distributors around the globe. In order to support our partners a technical service facility was established for fire detection and alarm systems. All the selection of products are UL, ULC, FM, EN54, LPCB, Anfor, Mea, Lloyd's, VdS, GOST, vb certified. ADEVA, our facility is equipped with modern fire system facilities, thus providing instant replies to the technical queries with the help of fast and reliable technical service. The products are guaranteed to perform at the same level as specified by our technical facility specifications. Novec™ 1230 (CF3CF2C (O) CF (CF3)2) contains the components of carbon, fluorine and oxygen while having once component inside called folroketo and are being manufacture by 3M TM companies. Colourless and Odourless with No electrical conductivity. In order to avoid the heat energy from the flames combustion reaction should be avoided. Novec ™ 1230 steel container is kept in a liquid phase and 24.8 bar (360 psig) is pressurized with nitrogen thus increasing the stream flow during discharge nozzle protects it from evaporate and mix with the air supplied. 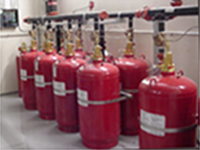 The FM-200® is a reliable solution for gas extinguishing applications, is a member of DuPont ™ family which is clean gas fire extinguishing systems class. FM-200® (CF3CHFCF3-heptafluoropropane) carbon, hydrogen and fluorine-containing non-colour, odourless, an electrically conductive composition. In order to block development of combustion, exposure to heat energy should be avoided with the property of breaking chain reaction it can cause burning fire. Aluminium, brass, rubber, plastic, steel and electronic equipments when exposed to FM-200® are absolutely not effected at all. 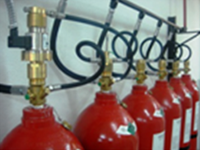 Argon contents includeIG01- IG55- IG100 inert gases, the general principle of the inert gas is to lower the oxygen level in the atmosphere in order to extinguish the fire. When the oxygen concentration falls below 15% in a confined space, such as 60 seconds, almost any kind of fire is extinguished under a short period of time. 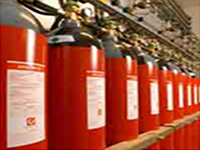 The concentration of oxygen in argon content includes extinguishing system falls to around 12.5%. Exposure at this level is assumed to be acceptable for the volume of people inside for a very short time. Most of the argon gas systems they are designed with a minimum concentration of 37.5%, extinguishing a fire with in 1 minute. Carbon dioxide gas is odourless, colourless, inert gas is being put by eliminating the oxygen that allows the body to go to the fire flares. 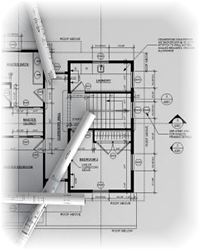 As the application method; Complete filling volume "Total Flooding" or a specific mass of regional application "Local Application" solutions are available. “Total Flooding” method is applied in an enclosed space so that maximum percentage of concentration can be achieved to extinguish the fire. “Local Application” method is applied directly onto the fire or in the region of the fire directly. - Fire-Resistant Chemicals, Paints, Plasters, etc. We offer solutions with these products. In context to early warning systems and automatic suppression systems this system is better as fire safety is of more concerned. 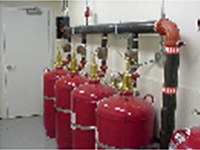 The system can be used in a built up area as described in passive fire precautions. 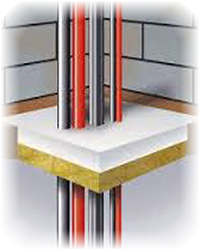 The most important objective of almost all materials used in passive fire insulation to prevent the progression of the fire for a certain period of time is to confine the fire to be isolated locality and create spaces allowing the smoke from the fire seal.